A History of laptops describes the efforts in the 1970s and 1980s to build small, portable personal computers that combine the components, inputs, outputs and capabilities of a desktop computer in a small chassis. 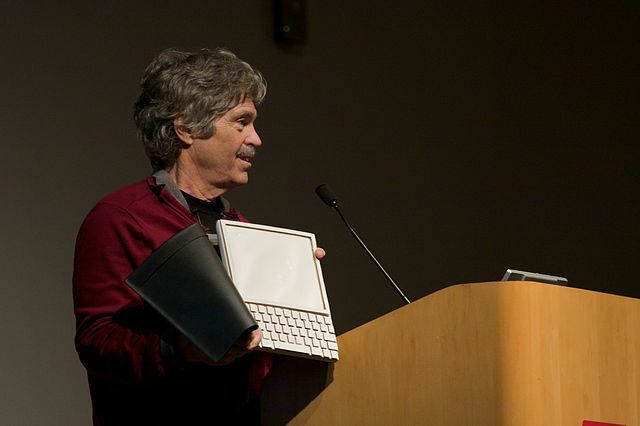 Before laptop/notebook computers were technically feasible, similar ideas had been proposed, most notably Alan Kay's Dynabook concept, developed at Xerox PARC in the early 1970s. One of the first reasonably portable computers was the Xerox NoteTaker, again developed at Xerox PARC, in 1976. However, only 10 prototypes were built. The first mass-produced microprocessor-based portable computer was the Osborne 1 in 1981, which used the CP/M operating system. Although it was large and heavy compared to today's laptops, with a tiny 5" CRT monitor, it had a near-revolutionary impact on business, as professionals were able to take their computer and data with them for the first time. This and other "luggables" were inspired by what was probably the first portable computer, the Xerox NoteTaker. The Osborne was about the size of a portable sewing machine, and could be carried on commercial aircraft. Although it wasn't released until 1985, well after the decline of CP/M as a major operating system, the Bondwell 2 is one of only a handful of CP/M laptops. It used a Z-80 CPU running at 4 MHz, had 64 K RAM and, unusual for a CP/M machine, a 3.5" floppy disk drive built in. It had an 80×25 character-based LCD mounted on a hinge similar to modern laptops, one of the first computers to use this form factor. A more enduring success was the Compaq Portable, the first product from Compaq, introduced in 1982, by which time the IBM Personal Computer had become the standard platform. Although scarcely more portable than the Osborne machines, and also requiring AC power to run, it ran MS-DOS and was the first true legal IBM clone (IBM's own later Portable Computer, which arrived in 1984, was notably less IBM PC-compatible than the Compaq.) The third model of this development, Compaq Portable II, featured high resolution graphics on its tube display. It was the first portable computer ready to be used on the shop floor, and for CAD and diagram display. It established Compaq as a major brand on the market. Another significant machine announced in 1981, although first sold widely in 1983, was the Epson HX-20. A simple handheld computer, it featured a full-transit 68-key keyboard, rechargeable nickel-cadmium batteries, a small (120×32-pixel) dot-matrix LCD with 4 lines of text, 20 characters per line text mode, a 24 column dot matrix printer, a Microsoft BASIC interpreter, and 16 KB of RAM (expandable to 32 KB). However, arguably the first true laptop was the Grid Compass 1101, designed by Bill Moggridge in 1979–80, and released in 1983. Enclosed in a magnesium case, it introduced the now familiar clamshell design, in which the flat display folded shut against the keyboard. The computer could be run from batteries, and was equipped with a 320×200-pixel electroluminescent display and 384 kilobyte bubble memory. It was not IBM-compatible, and its high price (US$8,000–10,000) limited it to specialized applications. However, it was used heavily by the U.S. military, and by NASA on the Space Shuttle during the 1980s. The GRiD's manufacturer subsequently earned significant returns on its patent rights as its innovations became commonplace. GRiD Systems Corp. was later bought by the Tandy (now RadioShack) Corporation. Another contender for the first true laptop was the Dulmont Magnum, designed Barry Wilkinson and Terry Crews Engineering Manager at Dulmison in 1982 and released in Australia in 1983 It included an 80×8 display in a lid that closed against the keyboard. It was based on the MS-DOS operating system and applications stored in ROM (A:) and also supported removable modules in expansion slots (B: and C:) that could be custom programmed EPROM or standard word processing and spreadsheet applications. However, the Magnum had no nonvolatile memory, but could suspend and retain memory in RAM, including a RAM Disk (D:). A separate expansion box provided dual 5.25-inch floppy or 10 MB hard disk storage. Dulmont was eventually taken over by Time Office Computers, who marketed the Magnum internationally in 16 and 25 line LCD versions, and also introduced the brandname Kookaburra to emphasize its Australian origins. The Ampere, a sleek clamshell design by Ryu Oosake, also made in 1983. It offered a MC68008 microprocessor dedicated to running an APL interpreter residing in ROM. 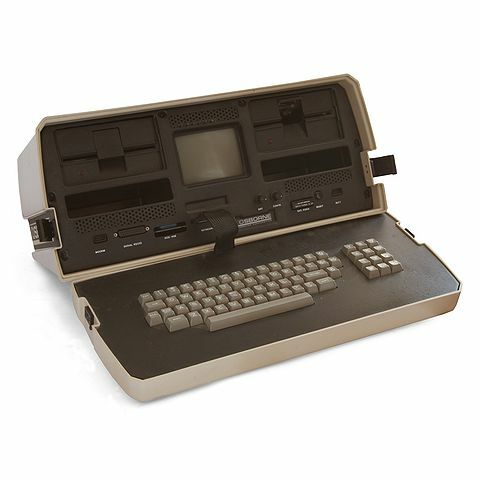 The TRS-80 Model 100 was an early portable computer introduced in 1983. It was one of the first notebook-style computers, featuring a keyboard and LCD, battery-powered, in a package roughly the size and shape of a notepad or a large book. It was made by Kyocera, and originally sold in Japan as the Kyotronic 85. Although a slow seller for Kyocera, the rights to the machine were purchased by Tandy Corporation, and the computer was sold through Radio Shack stores in the United States and Canada as well as affiliated dealers in other countries, becoming one of the company's most popular models, with over 6,000,000 units sold worldwide. The Olivetti M-10 and the NEC PC-8201 and PC-8300 were also built on the same Kyocera platform. Two other noteworthy early laptops were the Sharp PC-5000 and the Gavilan SC, announced in 1983 but first sold in 1984. The Gavilan was notably the first computer to be marketed as a "laptop". It was also equipped with a pioneering touchpad-like pointing device, installed on a panel above the keyboard. Like the GRiD Compass, the Gavilan and the Sharp were housed in clamshell cases, but they were partly IBM-compatible, although primarily running their own system software. Both had LCDs, and could connect to optional external printers. The Dulmont Magnum, launched internationally in 1984, was an Australian portable similar in layout to the Gavilan, which used the Intel 80186 processor. The year 1983 also saw the launch of what was probably the biggest-selling early laptop, the Kyocera Kyotronic 85. Owing much to the design of the previous Epson HX-20, and although at first a slow seller in Japan, it was quickly licensed by Tandy Corporation, Olivetti, and NEC, who recognised its potential and marketed it respectively as the TRS-80 Model 100 line (or Tandy 100), Olivetti M-10, and NEC PC-8201. The machines ran on standard AA batteries. The Tandy's built-in programs, including a BASIC interpreter, a text editor, and a terminal program, were supplied by Microsoft, and was written in part by Bill Gates himself. The computer was not a clamshell, but provided a tiltable 8 line × 40-character LCD screen above a full-travel keyboard. With its internal modem, it was a highly portable communications terminal. Due to its portability, good battery life (and ease of replacement), reliability (it had no moving parts), and low price (as little as US$300), the model was highly regarded, becoming a favorite among journalists. It weighed less than 2 kg with dimensions of 30×21.5×4.5 centimeters (12×8½×1¾ in). Initial specifications included 8 kilobytes of RAM (expandable to 24 KB) and a 3 MHz processor. The machine was in fact about the size of a paper notebook, but the term had yet to come into use and it was generally described as a "portable" computer. The Commodore SX-64, also known as the Executive 64, or VIC-64 in Europe, was a portable, briefcase or suitcase-size "luggable" version of the popular Commodore 64 home computer, and was the first full-color portable computer. The SX-64 featured a built-in five-inch composite monitor and a built-in 1541 floppy drive. It weighed 20 pounds. The machine was carried by its sturdy handle, which doubled as an adjustable stand. It was announced in January 1983 and released a year later, at $995 USD. Also among the first commercial IBM-compatible laptops was the IBM PC Convertible, introduced in 1986. It had a CGA-compatible LCD and 2 floppy drives. It weighed 13 lbs. Toshiba launched the Toshiba T1100 in 1985, and has subsequently described it as "the world's first mass-market laptop computer". It did not have a hard drive, and ran entirely from floppy disks. The CPU was a 4.77 MHz Intel 80C88, a variation of the popular Intel 8088, and the display was a monochrome, text-only 640x200 LCD. It was followed in 1987 by the T1000 and T1200. Although limited floppy-based DOS machines, with the operating system stored in ROM, the Toshiba models were small and light enough to be carried in a backpack, and could be run from lead-acid batteries. They also introduced the now-standard "resume" feature to DOS-based machines: the computer could be paused between sessions without having to be restarted each time. The first laptops successful on a large scale came in large part due to a Request For Proposal (RFP) by the U.S. Air Force in 1987. This contract would eventually lead to the purchase of over 200,000 laptops. Competition to supply this contract was fiercely contested and the major PC companies of the time; IBM Corporation, To shins, Compaq, NEC, and Zenith Data Systems (ZDS), rushed to develop laptops in an attempt to win this deal. ZDS, which had earlier won a landmark deal with the IRS for its Z-171, was awarded this contract for its SupersPort series. The SupersPort series was originally launched with an Intel 8086 processor, dual floppy disk drives, a backlit, blue and white STN LCD screen, and a NiCd battery pack. Later models featured an Intel 80286 processor and a 20 MB hard disk drive. On the strength of this deal, ZDS became the world's largest laptop supplier in 1987 and 1988. ZDS partnered with Tottori Sanyo in the design and manufacturing of these laptops. This relationship is notable because it was the first deal between a major brand and an Asian original equipment manufacturer. In 1987, HP released a portable version of their Vectra CS computer. It had the classic laptop configuration (keyboard and monitor closes up clam-shell style in order to carry), however, it was very heavy and fairly large. It had a full-size keyboard (with separate numeric keypad) and a large amber LCD screen. While it was offered with dual 3.5-inch floppy disk drives, the most common configuration was a 20 MB hard drive and a single floppy drive. It was one of the first machines with a 1.44 MB density 3.5-inch disk drive. Another notable computer was the Cambridge Z88, designed by Clive Sinclair, introduced in 1988. About the size of an A4 sheet of paper as well, it ran on standard batteries, and contained basic spreadsheet, word processing, and communications programs. It anticipated the future miniaturization of the portable computer, and as a ROM-based machine with a small display, can – like the TRS-80 Model 100 – also be seen as a forerunner of the personal digital assistant. By the end of the 1980s, laptop computers were becoming popular among business people. The COMPAQ SLT/286 debuted in October 1988, being the first battery-powered laptop to support an internal hard disk drive and a VGA compatible LCD screen. It weighed 14 lbs. The NEC UltraLite, released in mid-1989, was perhaps the first "notebook" computer, weighing just 2 kg (4.4 lbs). In lieu of a floppy or hard drive, it contained a 2 megabyte RAM drive, but this reduced its utility as well as its size. Although portable computers with clamshell LCD screens already existed before it, the Ultralite was the first computer in a notebook form-factor. It was significantly smaller than all portable computers that came before it. People can actually carry-it like a notebook and fold its clamshell LCD like a book cover over the rest of its body. The first Apple Computer machine designed to be used on the go was the 1989 Macintosh Portable (although an LCD screen had been an option for the transportable Apple IIc in 1984). Unlike the Compaq LTE laptop released earlier in the year the Macintosh Portable was actually a "luggable" not a laptop, but the Mac Portable was praised for its clear active matrix display and long battery life, but was a poor seller due to its bulk. In the absence of a true Apple laptop, several compatible machines such as the Outbound Laptop were available for Mac users; however, for copyright reasons, the user had to supply a set of Mac ROMs, which usually meant having to buy a new or used Macintosh as well. The Apple PowerBook series, introduced in October 1991, pioneered changes that are now de facto standards on laptops, such as room for a palm rest, and the inclusion of a pointing device (a trackball). The following year, IBM released its ThinkPad 700C, featuring a similar design (though with a distinctive red TrackPoint pointing device). Later PowerBooks featured optional color displays (PowerBook 165c, 1993), and first true touchpad (PowerBook 500 series, 1994), first 16-bit stereo audio, and first built-in Ethernet network adapter (PowerBook 500, 1994). In 1994, IBM released the RS/6000 N40 laptop based on a PowerPC microprocessor running the AIX operating system, a variant of UNIX. 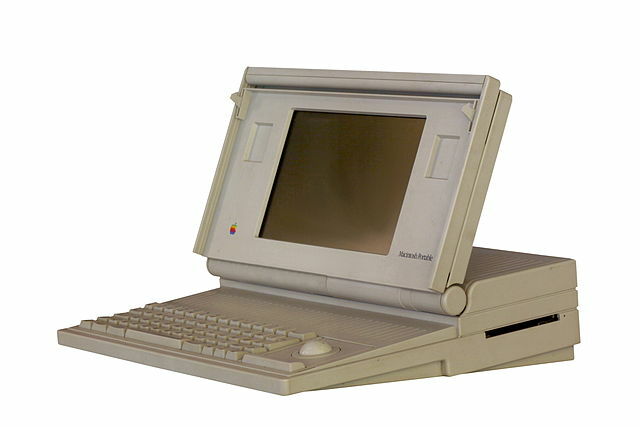 It was manufactured by Tadpole Technology (now Tadpole Computer), who also manufactured laptops based on SPARC and Alpha microprocessors, the SPARCbook and ALPHAbook lines, respectively. The summer of 1995 was a significant turning point in the history of notebook computing. In August of that year Microsoft introduced Windows 95. It was the first time that Microsoft had implemented the advanced power management specification with control in the operating system. Prior to this point each brand used custom BIOS, drivers and in some cases, ASICs, to optimize the battery life of its machines. This move by Microsoft was controversial in the eyes of notebook designers because it greatly reduced their ability to innovate; however, it did serve its role in simplifying and stabilizing certain aspects of notebook design. Windows 95 also ushered in the importance of the CD-ROM drive in mobile computing, and initiated the shift to the Intel Pentium processor as the base platform for notebooks. 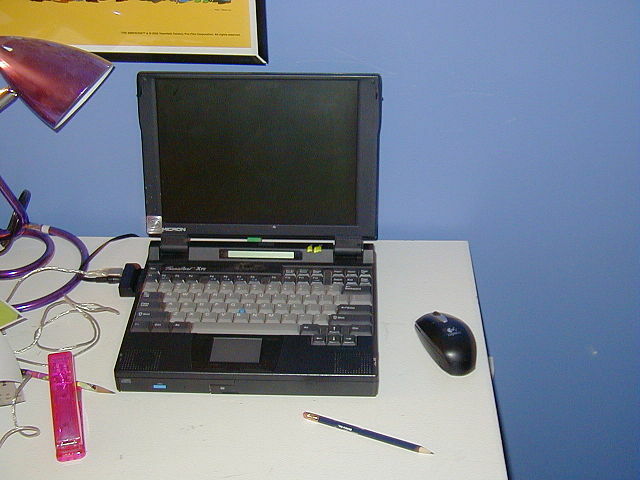 The Gateway Solo was the first notebook introduced with a Pentium processor and a CD-ROM. Also featuring a removable hard disk drive and floppy drive, the Solo was the first three-spindle (optical, floppy, and hard disk drive) notebook computer, and was extremely successful within the consumer segment of the market. In roughly the same time period the Dell Latitude, Toshiba Satellite, and IBM ThinkPad were reaching great success with Pentium-based two-spindle (hard disk and floppy disk drive) systems directed toward the corporate market. Improved battery technology. The heavy lead-acid batteries were replaced with lighter and more efficient technologies, first nickel cadmium or NiCd, then nickel metal hydride (NiMH) and then Lithium-ion battery and lithium polymer. Power-saving processors. While laptops in 1991 were limited to the 80286 processor because of the energy demands of the more powerful 80386, the introduction of the Intel 386SL processor, designed for the specific power needs of laptops, marked the point at which laptop needs were included in CPU design. The 386SL integrated a 386SX core with a memory controller and this was paired with an I/O chip to create the SL chipset. It was more integrated than any previous solution although its cost was higher. It was heavily adopted by the major notebook brands of the time. Intel followed this with the486SL chipset which used the same architecture. However, Intel had to abandon this design approach as it introduced its Pentium series. Early versions of the mobile Pentium required TAB mounting (also used in LCD manufacturing) and this initially limited the number of companies capable of supplying notebooks. However, Intel did eventually migrate to more standard chip packaging. One limitation of notebooks has always been the difficulty in upgrading the processor which is a common attribute of desktops. Intel did try to solve this problem with the introduction of the MMC for mobile computing. The MMC was a standard module upon which the CPU and external cache memory could sit. It gave the notebook buyer the potential to upgrade his CPU at a later date, eased the manufacturing process somewhat, and was also used in some cases to skirt U.S. import duties as the CPU could be added to the chassis after it arrived in the U.S. Intel stuck with MMC for a few generations but ultimately could not maintain the appropriate speed and data integrity to the memory subsystem through the MMC connector. A more specialized power saving CPU variant for laptops is the PowerPC 603 family.Derived from IBM's 601 series for laptops (while the 604 branch was for desktops), it found itself used on many low end Apple desktops before it was wildly used in laptops, starting with PowerBook models 5300, 2400, 500 upgrades. Ironically, what started out as a laptop processor was eventually used across all platforms in its follow up PPC 750. Improved Liquid-crystal displays, in particular active-matrix TFT (Thin-film transistor) LCD technology. 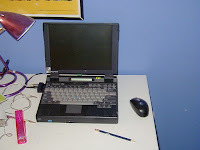 Early laptop screens were black and white, blue and white, or grayscale, STN (Super Twist Nematic) passive-matrix LCDs prone to heavy shadows, ghosting and blurry movement (some portable computer screens were sharper monochromeplasma displays, but these drew too much current to be powered by batteries). Color STN screens were used for some time although their viewing quality was poor. By about 1991, two new color LCD technologies hit the mainstream market in a big way; Dual STN and TFT. The Dual STN screens solved many of the viewing problems of STN at a very affordable price and the TFT screens offered excellent viewing quality although initially at a steep price. DSTN continued to offer a significant cost advantage over TFT until the mid-90s before the cost delta dropped to the point that DSTN was no longer used in notebooks. Improvements in production technology meant displays became larger, sharper, had higher native resolutions, faster response time and could display color with great accuracy, making them an acceptable substitute for a traditional CRTmonitor. OLPC XO-1 laptop in Ebook-Mode. Improved storage technology. Early laptops and portables had only floppy disk drives. As thin, high-capacity hard disk drives with higher reliability and shock resistance and lower power consumption became available, users could store their work on laptop computers and take it with them. The 3.5" HDD was created initially as a response to the needs of notebook designers that needed smaller, lower power consumption products. With continuing pressure to shrink the notebook size even further, the 2.5" HDD was introduced. One Laptop Per Child (OLPC) and other new laptops use Flash RAM (non volatile, non mechanical memory device) instead of the mechanical hard disk. Improved connectivity. Internal modems and standard serial, parallel, and PS/2 ports on IBM PC-compatible laptops made it easier to work away from home; the addition of network adapters and, from 1997, USB, as well as, from 1999, Wi-Fi, made laptops as easy to use with peripherals as a desktop computer. Many newer laptops are also available with built-in 3G Broadband wireless modems. a fingerprint sensor for implementing a restriction of access to a sensitive data or the computer itself. In June 2007, Asus announced the Eee PC 701 to be released in October, a small lightweight x86 Celeron-M ULV 353 powered laptop with 4 GB SDHC disk and a 7-inch screen. Despite previous attempts to launch small lightweight computers such as ultra-portable PC, the Eee was the first success story largely due to its low cost, small size, low weight and versatility. The term 'Netbook' was later dubbed by Intel. Asus then extended the Eee line with models with features such as a 9-inch screen and other brands, including Acer, MSI and Dell followed suit with similar devices, often built on the fledgling low-power Intel Atom processor architecture. In 2009, Qualcomm introduced a new term "smartbook", which stands for a hybrid device between smartphone and laptop. Last updated on 8 May 2016 at 06:11.